Photo from our local newspaper, Nice-Matin showing the winners at PhotoMenton, where I was lucky enough to be awarded third prize (for the third year running - (118 exhibitors) and also two exhibitions for 2016, in Castillon and also at the Casino Barriere in Menton. Am very proud as you can imagine! Thanks so much to my friends who visited and voted for my photography in the Prix du Public! 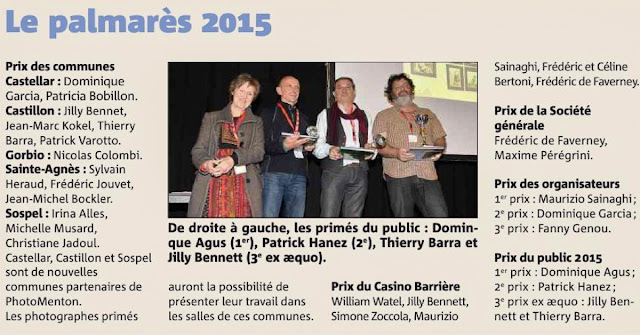 Photo de notre journal local, Nice-Matin montrant les gagnants de PhotoMenton où j'ai eu la chance de me voir attribuer le troisième prix pour troisieme annee consecuif (118 exposants ) et aussi deux expositions pour 2016 ,l'une à Castillon et l'autre au Casino Barrière de Menton .Comme vous pouvez imaginer, je suis très fière ! Merci beaucoup à mes amis qui ont fait la visite et voté pour mes photos dans le Prix du public ! Oh congratulations. I do think you are a fine photographer doing excellent work. I would have voted for higher than 3rd, but then, they didn't ask me. Madame Jilly, vous méritez le premier prix! J'aime bien vos photos et votre blog. Vous êtes particulièrement douée pour la photographie. Jilly you're being too modest - you weren't "lucky" to get a prize for the third year running, you got it because you're a bloody good photographer, that's why! I'm so proud of you, CONGRATULATIONS!!! You look great in that photo in front of your stand and the one in the newspaper.